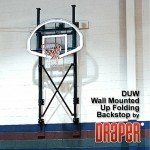 Large selection of wall mount basketball goals, backboards, hoops, and mounting structures for indoor gymnasium use. Top brands like Draper, First Team. 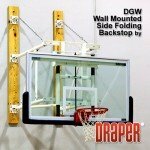 The Draper wall mount basketball goals shown on this page come with custom cut to length mounting structures. After your order is placed Draper engineering dept. will prepare a shop drawing depicting the contents of your along with an ATM (authorization to manufacture form). It typically takes a week before the drawing is completed and emailed to you for your approval. After you review the drawing and if everything meets with your approval, simply sign the ATM form and fax or email it back to Basketball-Goals.com our fax number is 866-892-7277 and our email address is admin@basketball-goals.com. After we receive your signed ATM your order is placed in the producttion queue and from that time it normally takes 1-2 weeks for your order to ship out, and depending on your location 3-5 business days to arrive at your location. 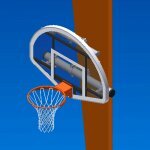 We offer several different types of wall mount basketball goals here at Basketball-Goals.com. We offer side folding, column mounted, stationary, up folding wall mount basketball goals. Each of these types of systems provides athletic directors with excellent equipment that will be a proper fit in most gymnasiums.